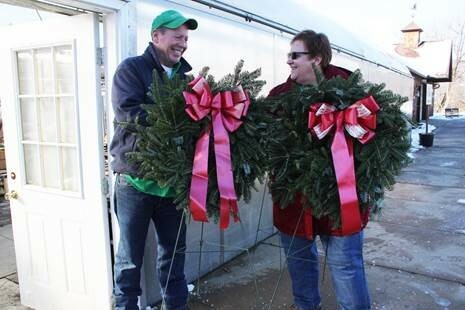 Dan Evans, owner of Pleasant Valley Greenhouses & Nursery, provides wreaths to Linda Manross for the graves of people we supported. The lives of 40 people we once supported are remembered with gratitude, as our staff and a local business give back. Linda Manross and Mike MacWilliams, both of whom launched the Agency’s staff-supported “We Remember Committee” several years ago, placed wreaths on graves of people we once supported in St. Bonaventure, Allegany and Five Mile cemeteries, all in Allegany; Mt. View in Olean, Pleasant Valley in Hinsdale, Crawford and Calvary cemeteries in Salamanca, and Chestnut Hill Cemetery in Portville. “The goal of the We Remember Committee is to ensure that we remember those who have passed away by taking care of their graves. Flowers are planted in the spring in addition to the distribution of Christmas wreaths,” Mike said. The committee also includes Allen Frank, Lisa Phearsdorf, and Mickey Harwood.